Our final two HepsNation athletes – both affiliated with Columbia – took to the track in London this past weekend at the IAAF World Championships. Columbia’s rising senior Akua Obeng-Akrofi ran the third leg for Ghana’s 4×100 relay team on Saturday morning in the preliminary rounds. She helped the team to a season’s best time of 43.68, but it wasn’t fast enough for the Ghanian team to make the finals. The team finished sixth in their heat. We will see her again during the indoor track season. 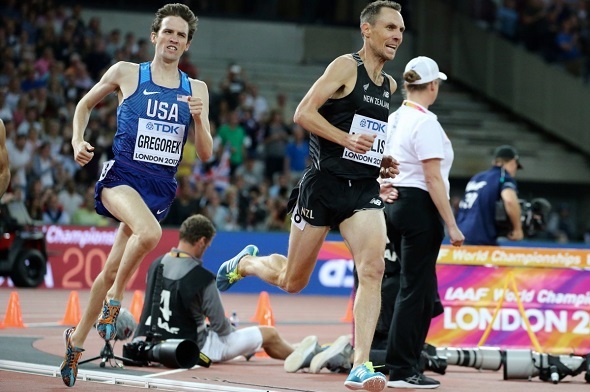 Meanwhile, Columbia alum Johnny Gregorek competed in his first global final on Sunday night as he was the sole American to make it to the 1,500m final. Gregorek stuck to a similar strategy in the finals with aim of making it to a medal position – try to keep contact and then unleash his speed in the final 200m. Unfortunately, he wasn’t able to generate the speed he needed for that last lap as he finished in 10th place with a time of 3:37.56, just behind three-time World 1,500m champion Asbel Kiprop of Kenya (9th) and two-time Olympic medalist Nick Willis of New Zealand (8th). Even though he was disappointed, he was still happy with the experience. Always dreamed of wearing the 🇺🇸. Never imagined I would feel so much love and inspiration in the process! Running is cool, kids. Gregorek’s season isn’t over yet as he is scheduled to run a few more races state-side this summer. This entry was posted on Monday, August 14th, 2017 at 7:38 pm. It is filed under Alumni, Featured, Spotlight. You can follow any responses to this entry through the RSS 2.0 feed.